Helen Lenskyj, Professor, Department of Sociology and Equity Studies in Education, University of Toronto, speaks on the Olympic Industry and resistance to it in the lead up to the 2010 Vancouver Olympics. 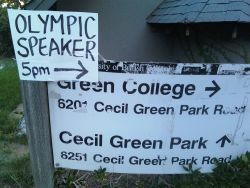 Lenskyj spoke yesterday at Green College, on the UBC campus, as part of the Olympics Critic Speakers Series. This is part one of that talk. Listen to part two.